Rugged as the island from which it was born, Sitka Gear's Kodiak Jacket is the ultimate in extreme and extended protection for rainy coastal climates. A knee-length durable 3-layer GORE-TEX® Pro laminate ensures complete waterproof coverage with the option of shortening the jacket to a standard length with internal snaps for unencumbered hikes. Rugged as the island from which it was born, Sitka Gear &apos;s Kodiak Jacket is the ultimate in extreme and extended protection for rainy coastal climates. 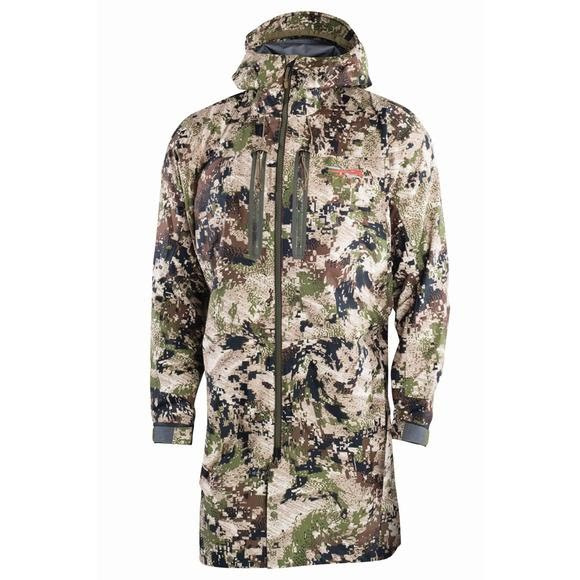 A knee-length durable 3-layer GORE-TEX® Pro laminate ensures complete waterproof coverage with the option of shortening the jacket to a standard length with internal snaps for unencumbered hikes. Pit zips easily allow instant relief from overheating. Four chest pockets are conveniently located to store essentials, and two reach-through pockets grant quick access to dry layers underneath. Whether breaking trail through soaked brush in pursuit of brown bear or enduring a torrential storm on the boat back to camp, the Kodiak Jacket has you covered.